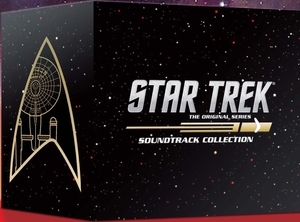 The 248th Soundtrack of the Week is the soundtrack event of the year: La-La Land's release of the complete music from Star Trek (the original series) on 15 CDs! This is something I've been dreaming about for years. When I was twelve years old I made audio recordings of a couple of Star Trek episodes ("Shore Leave" and "A Taste of Armageddon") and used to listen to them over and over. It's simply amazing to have the complete music in one package. And it really is complete. It has the Desilu tag, the different versions of the Alexander Courage's main title (with electric violin or voice or cello or what have you), alternates, outtakes, and apparently every scrap of library music, including those library cues that were created by modifying music written as part of an original score for an episode. In addition to Courage, great composers Jerry Fielding, Sol Kaplan, Gerald Fried, George Duning and others provided music for the program. Each season gets five discs and the box itself has four booklets with over a hundred pages of liner notes. I haven't listened to the whole thing yet. That would take about seventeen and a half hours. But I'm getting there!